2017 Distinguished Government Service Award: Ohio Senator Randy Gardner (2nd District) received this year’s 2017 Distinguished Government Service Award for his committed support and advocacy of Ohio’s career colleges and schools. 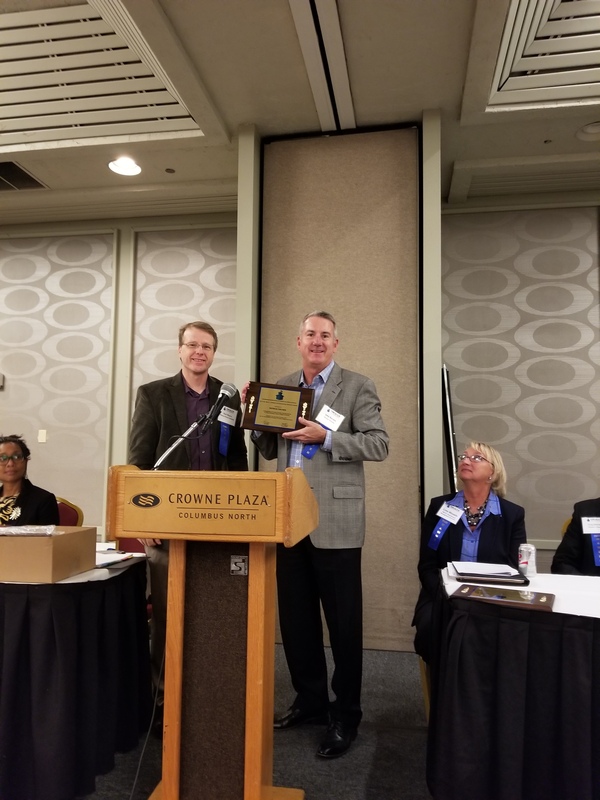 Senator Gardner was unable to attend due to a scheduling conflict, however his Senior Legislative Aide of 27 years, Shelby Hartley, accepted the award on his behalf from OMACCS Board Member, Diane Brunner from Davis College. 2017 Dr. Max Lerner Distinguished Service Award: OMACCS awarded the 2017 Dr. Max Lerner Distinguished Service Award to TWO recipients for their continued support and partnership of the Ohio and Michigan career colleges and schools. Christine Gregory and her team at Educational Management Services and Patricia Fischer, former President and CEO of Dorsey Schools received this distinguished honor. Christine and Patricia were unable to attend, however, Board Member Lynn Mizanin from Educational Management Services accepted the Award on behalf of Christine, and John Barnes from Dorsey Schools accepted the Award on behalf of Patricia. Board President Kurt Mayry presented both Award. 2017 R. David Rankin Leadership Award: Jackie Marshall, from Ohio Business College and former OMACCS Board Member and Secretary, received the 2017 R. David Rankin Leadership Award for her ongoing commitment and service to our Association and for being a valued OACCS/OMACCS Board Member and Officer for nine-years. Her dedication to OACCS/OMACCS, as well as our sector of higher education, is beyond compare! Jackie was presented this honor and Award by former OACCS Executive Director, Dave Rankin. 2017 Distinguished Alumni Award: OMACCS awarded the 2017 Distinguished Alumni Award to TWO recipients for their continued success in the workplace, as well as their contributions to OMACCS, our member schools, and their communities. Brian Kulp (pictured below) from Fortis College in Westerville and David Rumble (unavailable for a photo) from the Motion Picture Institute, were this year’s recipients of the Award. 2017 Outstanding Career Services Award: This year’s recipients for the 2017 Outstanding Career Services Award are: David Achille (pictured below) from Daymar College; Robert Garver from Stautzenberger College (Maumee); Faith Kirnberger from Ross Medical Education Center (Port Huron); Courtney Martin (pictured below) from Ohio Valley College of Technology; Cathy Reilly from Ross Medical Education Center (Brighton), and Vyktorya Williams from Dorsey Schools (Detroit). 2017 Outstanding Faculty Award: This year’s recipients for the 2017 Outstanding Faculty Award are: Sylvia Bell (pictured below) from Daymar College; Tony Deemer from Ohio Media School (Cincinnati); Carol Doan (pictured below) from Fortis College of Nursing (Westerville); Michele Dominguez from Ross Medical Education Center (Taylor); Peter Falzarano (pictured below) from Fortis College (Westerville); Sarah Hess from Davis College; Dale Kirsch from Ohio Business College (Sheffield Village); Mike A. Knitz from Stautzenberger College (Maumee); Svetlana Leprich from Dorsey School (Detroit); Angela Mendosa (pictured below) from Ohio Business College (Sandusky); Megan Norwalk from Stautzenberger College (Maumee); Bobbie Novak (pictured below) from Fortis College of Nursing (Westerville); Aaronica Phommalee from Stautzenberger College (Maumee); Jennifer Ritter from Ross Medical Education Center (Brighton); Richard Rothrock from Motion Picture Institute; Brittany Shinabery from Daymar College, and Mary Taylor (pictured below) from Orion Institute.